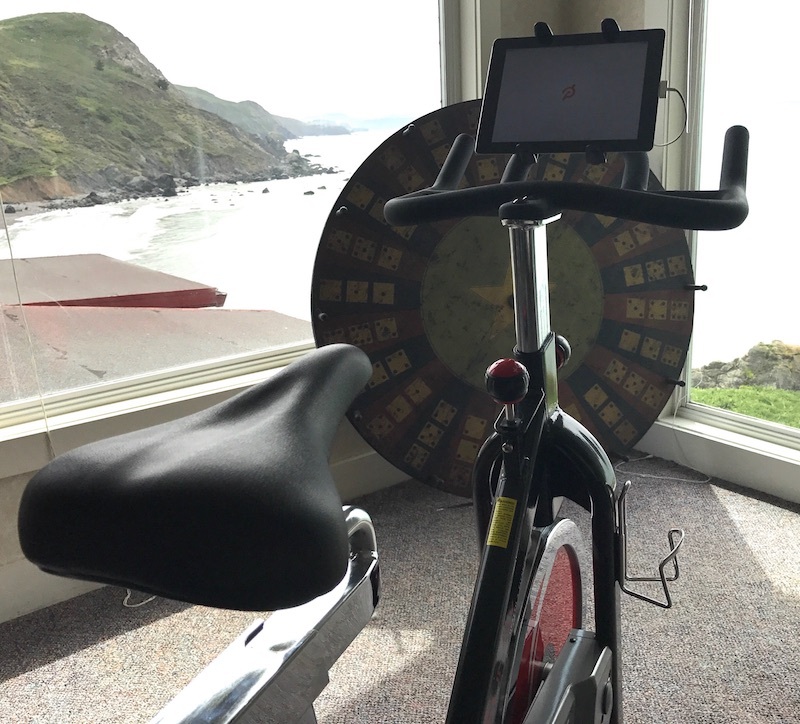 I have posted a couple times about my DIY Peloton indoor exercise bike. I recently added weights for the arm and chest exercises. I like them. "Your legs are really muscle-y!" said my fitness obsessed 11 year-old gymnast. I thanked her and remarked as to how I've been riding my bike 4 times a week. She was helping spot me as we worked on my abdominal exercises. They take a lot of care due to my really fucked up lower back. "Your legs look great," she remarked again, "but your arms and chest are kinda just skinny." Hey... she pointed it out. That helps! I certainly suffer a bit from the "all cycling, no lifting" body-type. Velociraptor style. My legs are pretty damn strong, I like to kill it on the bike. I've also been riding a lot of Peloton classes via the subscription service lately. Peloton led classes give me a much better workout than watching Twitch streamers play Fortnite. The calorie difference measured by Wahoo Fitness, the app-manager for my cadence and heart rate sensors, is 300 vs 550 cal expended over the same 45minute time period. I know those calculations are both probably high, but as a benchmark the Peloton classes make me feel better about having gotten on the bike. Peloton seemingly acknowledges that too much of a good thing can lead to incongruous muscle development. The stock bike they sell, for several thousands of dollars, comes with a weight set. Many Peloton classes are "Arms and Intervals." You'll get one or two several minute arm and chest workouts, separated by interval or tabata training on the pedals. Before I got weights,I would skip those classes. Peloton's library of available material is immense. When I did take a class that involved arms I would just work extra hard at climbing a hill while the instructor did the arms stuff. I put my whole home rig together for under $600, and I intentionally left out the weights. Weights weren't expensive or even hard to find -- my focus was "Who cares? I just need the cardio!" No more, I bought this simple set of weights from Amazon. I proudly thought "Oh, who'll need the 2 lb weights. I am sure I'll start with 3 or maybe even the 5." I am using the 2 lb weights when on the bike. I keep them in the cheap plastic stand Amazon provides, on a small table right next to the stationary cycle. I do not have to twist or tweak my back at all when reaching for the weights. The arms workouts exhaust me using the 2lb weights. After a few weeks I am still stopping to catch my breath. I haven't seen any huge POSITIVE changes in me, but I feel fatigued after the ride/workout. Later in the day I feel soreness in the muscles we've worked. Something is happening. Swinging the weights around while pedaling the cycle can throw your back out something quick! Make sure your movements are really controlled! As in everything, I am extremely careful not to hurt my back with these weights. When I do mess up I try to recover and get back to being active as quickly as I can. My usual MO is too take far too long babying myself. I often set my progress waaaaay back. I've been trying hard not to let that happen. I started with the DIY Peloton/Sunny Bike holding the simple hope I'd do something that would help increase my circulation, and maybe possibly lower my typical place on the pain scale. I was recently discussing with a friend how I felt once you'd earned a persistent level on that scale it was damn near impossible to dial back. I was at a 4, and I'd live at a 4. Having put in a few months of hard work on the bike, and working on my core to support the lower back, I am more flexible, more active, and less in pain.